It is a fact that that the crime rate is on the increase. A person who is trained in self defence is more capable of handling difficult situations involving personal safety. 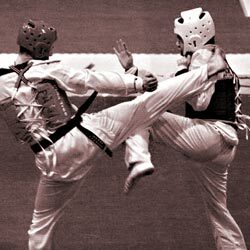 Taekwondo is an art primarily concerned with self-defence, and as self-defence taught by our instructors is one of the most effective arts of unarmed self-defence. Women would benefit greatly from Taekwondo self defence system. The training methods designed are easy to understand and do. Self defence is for everyone. We use medically approved training methods as well as weight loss methods and general keep fit. Practical self-defence is suitable for all ages.